Limited quantities of all of CDAC's publications are available for pick up Mondays through Fridays (we are closed on state holidays) between the hours of 8 AM and 4 PM. We only accept cash or check, no credit cards. Receipts available upon request. Return Policy: Returns are generally accepted within 60 days of purchase. Items must be returned in their original condition and with prior approval from our office. Refunded amounts will be less the cost of shipping. Returns will not be accepted on outdated versions of publications, or publications we no longer sell. 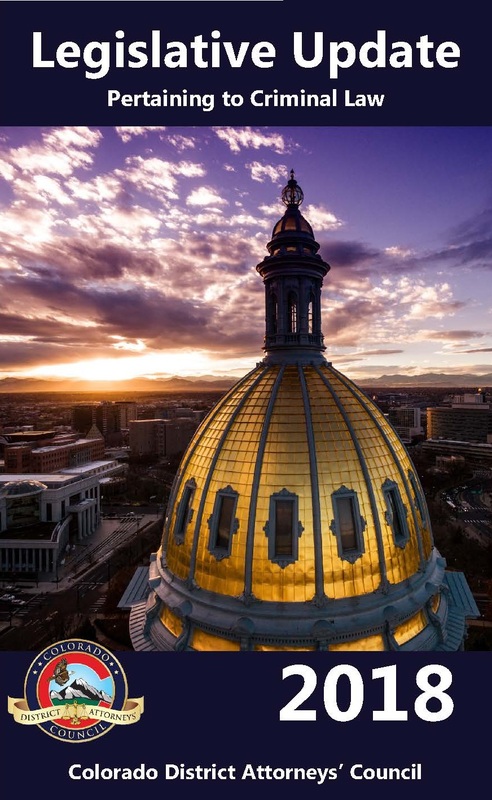 2018 Colorado Revised Statutes Pertaining to Criminal Law, with eBook access. Included in this book is Title 18, along with parts of titles 13, 16, 19, and 42 relevant to criminal law. Additionally, the Rules of Criminal Procedure and Rules of Evidence are provided. Books are available for shipping or for pick up in our office. Please see order details below. We no longer have the 2017 CRS version available. The cost of the 2018 CRS is $56.32* ($52.00+$4.32 tax) per book with no cost for shipping. To order, please send a check to our office along with a short note regarding what you are ordering and the address you would like the book shipped to. Please provide a full street address - no PO boxes. *If you are with a law enforcement agency or district attorney's office, please email us for discounted pricing and invoicing information. We provide email notifications for those that wish to be informed when the newest version of this book is about to be released. If you would like to be added to our mailing list, please email us at info@cdac.state.co.us. Please make sure to add info@cdac.state.co.us to your "Safe Senders" list to prevent these emails from entering your spam or junk folders. As a note, we no longer send the postcards for publication notifications. This publication is updated annually in November. 2018 Legislative Update Booklet Now Available - CDAC has compiled summaries of new legislation affecting criminal justice and law enforcement into a convenient booklet. This year's booklet is only $22.25 each ($15 book + $6.00 shipping + $2.25 tax). To order, please send a check to our office along with a short note regarding what you are ordering and the address where you would like the book shipped. Please provide a full street address - no PO boxes. Books will also be available for pick up from our office any time Monday-Friday (we are closed on state holidays), 8:00 a.m. - 4:00 p.m. This publication is updated annually in July. 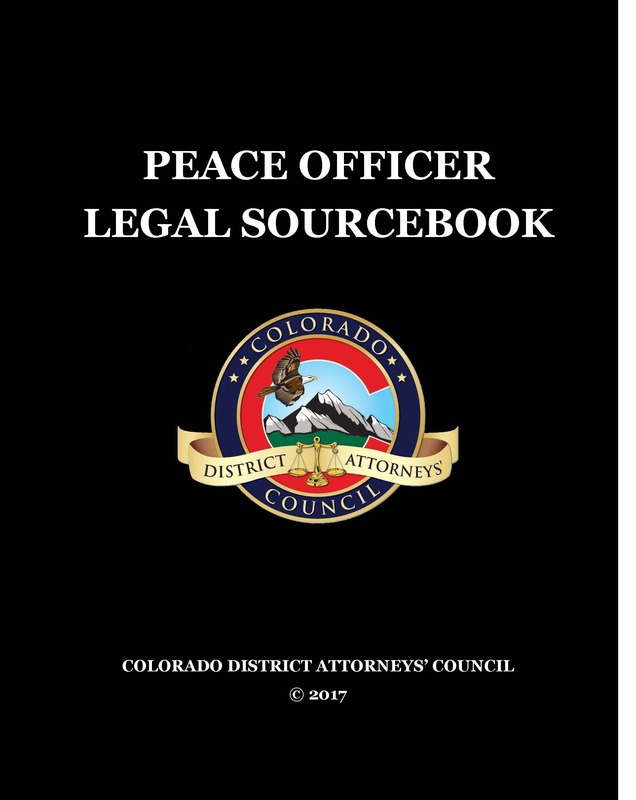 Peace Officers Legal Sourcebook - a valuable reference tool for law enforcement officers with legal guidance on matters such as search and seizure, interrogation, and evidence. Includes updated case law through 2017. The 2017 version of this publication is now available for purchase. The cost is $44.91 ($35.00 for the book + $2.91 tax + $7.00 shipping). Tax exempt agencies should omit tax. To order, please send a check to our office along with a short note regarding what you are ordering and the address you would like the book shipped to. Books are also available for pick up in our office, any time Monday-Friday (we are closed on state holidays), 8:00 AM to 4:00 p.m. Cash or check payments will be accepted. If you are with a law enforcement agency and wish to be invoiced, please email us with that request.